Signed and dated lower left: "Bill Scott 10"
Signed and dated lower right: "Bill Scott 09-10"
Signed and dated lower left: "Bill Scott 11"
Signed and dated lower right: "Bill Scott 11"
Signed and dated upper left: "Bill Scott 10"
Signed and dated lower right: "Bill Scott 10"
Hollis Taggart Galleries is pleased to present an exhibition of the recent paintings of Bill Scott. The twenty paintings on view are imbued with a joie de vivre that has long been a hallmark of Scott’s lushly colored, abstracted compositions. In addition to these works, this exhibition showcases paintings that introduce an important new compositional element—as the artist re-interprets iconic historical works of art in his own uniquely inventive idiom. Scott’s network of complex geometries prevail in all the paintings in our exhibition. In Window, the forms are rectangular, suggesting both the window’s panes and the view of nature beyond. Scott’s mastery of visual play and pun is seen in the blocks’ subtle layering, which denies literal reading. Instead, the areas of luminous color float above each other. Little Pink Cherry Tree (2009–10) takes a different approach to geometry; the forms are organic traceries, overlapping in an intricate arrangement in a highly saturated palette. A lifelong Philadelphia resident, Scott studied informally with Joan Mitchell and formally at the Pennsylvania Academy of the Arts, where he is now a respected teacher. 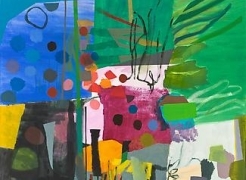 Bill’s Scott’s fourth exhibition at Hollis Taggart Galleries, continues to affirm his dedication to pushing the boundaries of expanding the boundaries of form and color.